Imagine you’re walking through your own furniture factory and notice the most beautiful, massive plank of American Cherry Wood that you’ve ever seen. It seems that it would be such a waste to cut this beautiful plank into small boards for furniture. And that’s how live edge furniture was born. This style of furniture features a raw-looking edge, the planks are all unique and can be finished with or without the bark. 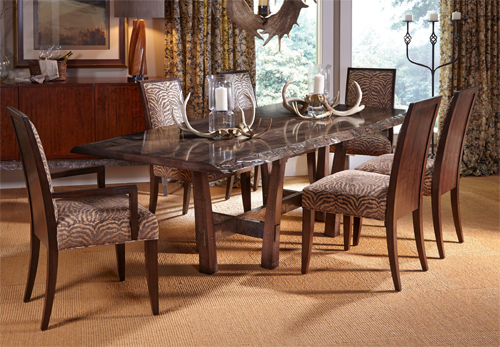 Tables are not always perfect rectangles, but that lends to their charm. The base of the table can vary from metal supports to typical wood legs. Which style is right for you? The individual taste of my client tells me which style best fits their interior design needs. What a terrific way to appreciate the unique graining of the wood! 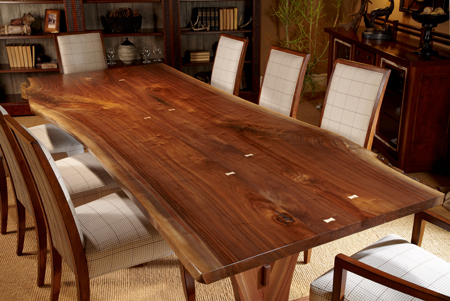 The manufacturer of the tables featured here is Harden, which has planted and maintained its own American Cherry Wood forest for nearly 150 years. The company, headquartered in Mc Connelsville, New York, is run by a member of the founding Harden family. Cherry is Harden’s wood of choice, and the wood is harvested, sawn, cured and even hand-carved by the wonderful artisans working in the factory. Some of these craftsmen represent multiple generations that have worked for Harden through the years. This takes the meaning of “sustainable” to an entirely new level. 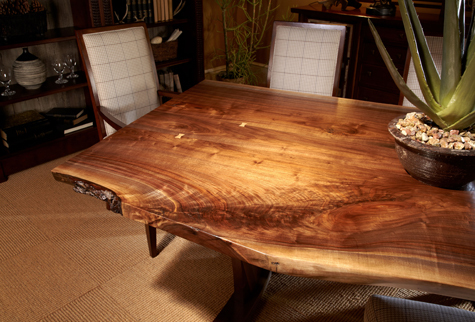 If you’d like to have an entirely unique dining table for your holiday celebration, consider this live edge cherry dining table. If you order now, you can have your own one-of-a-kind creation in your dining room by Christmas. See more articles on design trends here.